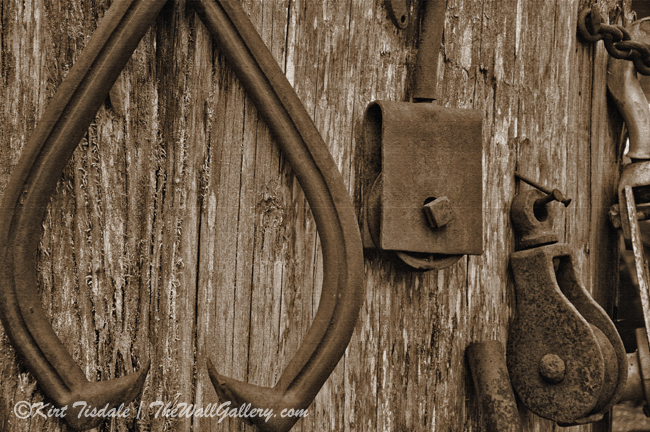 My featured Art Print this week is actually four of them from my Sepia Photography Gallery. They are: “ Logging Tools” – “Mine Cart” – “Wagon Wheel Hub” and “Cedar Rapids Barn”. I’m featuring four prints to illustrate some examples of the type of shots I think make good sepia tone photographs. Dating back to the 1880’s, sepia toning was a chemical change used on black and white photographs to give them a warmer look and to enhance the archival qualities. Today, we associate the look with old historic photographs. With the advent of digital photo manipulation, it is very easy to recreate that look on any photograph. I use it to support a look that I associate with the tone as being old, historic and rustic. The type of subject matter that I convert to a sepia tone fits into that category and is what comprises my Sepia Photography Gallery. My first example is from the Issaquah, Washington Railroad Depot Museum, which was built in 1889. This particular train station was an important stop between the mountain towns in the Cascades and Seattle. Issaquah became a point of export for timber, thus the example of tools used to handle the transportation of timber. By it’s very nature, this shot depicts elements dating back to the time of sepia, so it seems pretty natural to show it with those tones. 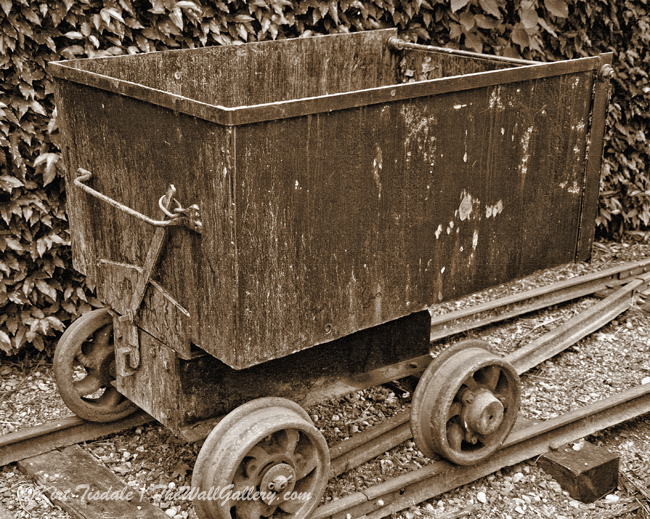 The next photograph is from the same museum, but depicts a different industry that the area was well-known for; mining. 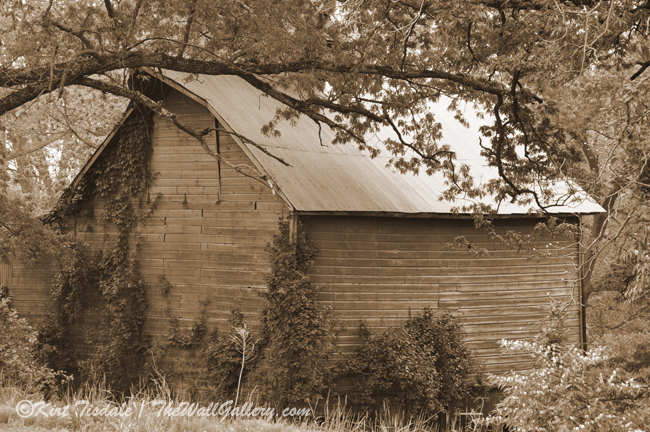 This is another obvious use of the sepia tone to create that old rustic look. 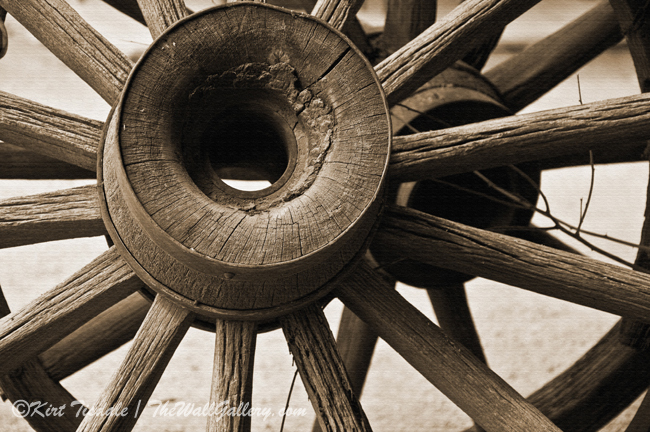 The third shot is an old west wagon wheel I found as part of the ambience for shops set up like an old west town in Cave Creek, Arizona. Again, this seems obvious due to the historic factor of the subject matter. The last shot is an old barn I found by accident in Cedar Rapids, Iowa. In an area on the outskirts where large homes with multiple acres of land have taken over, I saw this barn out of the corner of my eye off the main road behind some trees. Doing my usual, I processed what I think I saw in a short flash, found a place to turn around and drove back to where I had spotted it. It was a short hike through the trees, but I got some great shots. The barn isn’t as old as the use of sepia tones, but due to the condition of the building, I liked the look that this tone gave it. Maybe these shots seemed like obvious subject matter, but not everything that is “obvious” really looks good in a sepia tone. I think the tone enhanced the look of these subjects and made the final print more interesting. Sepia, just like black and white photography has to have elements of contrast and lines to make a photograph “pop”. The other interesting aspect of this type of art print is how it has been used in interior decor. I have been surprised to see a number of these “old rustic” shots used in more contemporary interior design where warm earth tones are important elements to the overall look. So much of the final look depends on the matting and framing. Thoughts? This entry was posted in Photography, Sepia Photography and tagged barn, Cave Creek, cedar rapids, Issaquah Railroad Station Museum, kirt tisdale, old west, online art gallery, photographer, railroad, sepia prints, sepia tone on December 2, 2014 by Kirt D Tisdale. As promised last week, here is the sister print to “Picnic Table by the Tracks”. This art print is titled: “ Railroad Tracks and The House” and both are from my Landscape Oil Gallery. This print is also done using an impasto oil technique. As with last weeks, this style uses large brush strokes and bright, bold colors. Both elements seem appropriate for this print to make the setting really pop with color and texture. The setting is the same row of trees as in last weeks picture, but the angle has changed and so has the subject matter of the print. The color of the turning leaves grabs your eye with the vibrant oranges and yellows. The railroad tracks are still a central theme, but in this view, we see them run parallel to the row of trees very close to a house. In this perspective you see the tracks go way off into the distance creating that depth I like. I love fall colors and I love a picture that pulls me in. The questions arise from looking at this scene. Where does the track go? Why is it so close to a house? 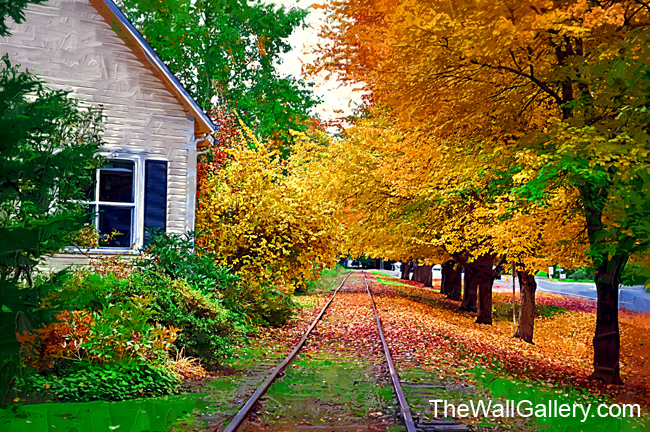 Who would live in a house with a railroad track that close? The tracks are abandoned and lead to historic downtown Issaquah and what is now a Train Depot Museum, but what was once a passenger and freight depot serving this area. This was one of many stops between downtown Seattle and the mountain towns in the Cascade Range just to the east of Issaquah. The train service and tracks date back to 1889 and were used up until the 1940’s. Today the depot is listed in the National Register of historic places. The house doesn’t look like it dates back that far, maybe the 40’s or 50’s and may have been built after the tracks were abandoned; I’m really not sure. The house is currently used as the home of the Issaquah Chamber of Commerce and the picnic table from last weeks art print is in the back yard of the Chamber of Commerce. I would assume employees use it during nice weather. So, the mystery of the tracks themselves is solved. The house and closeness to the tracks still remains a mystery to me, but the tracks as you can tell follow a straight line and parallel an existing road. I felt very lucky the day I did the original photo-shoot that started this process, to not only get the fall leaves near their peak, but to capture some interesting elements into a couple of art prints. Thoughts? 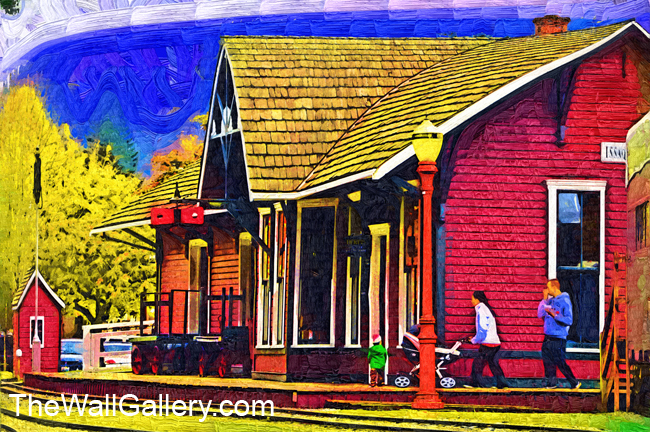 This entry was posted in Art Prints, Landscapes: Oil and tagged art galleries, artist kirt tisdale, autumn colors, fall foliage, interior design, Issaquah Railroad Station Museum, issaquah washington, online art gallery, railroad, railroad tracks on October 13, 2014 by Kirt D Tisdale. “The Old Railroad Station” is from my Architecture Gallery. 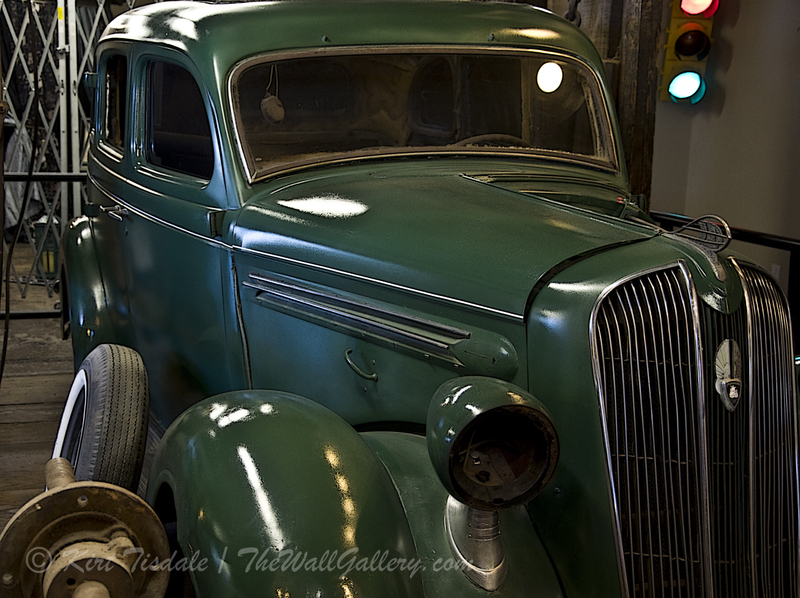 It’s one of 56 new prints just added to the gallery last week. The subject has been covered in my blog: A Photo Shoot “The Old Railroad Station”, but this is one of the final art prints resulting from that shoot. I still have the young family spending a fall afternoon walking the grounds of the Issaquah Railroad Station Museum. On site are railroad cars, engines and logging equipment important for this region of the country. This station use to be one of the main stops between the mountain towns in the Cascade Mountain Range and downtown Seattle (which Issaquah is now an eastern suburb of sitting in the foothills). 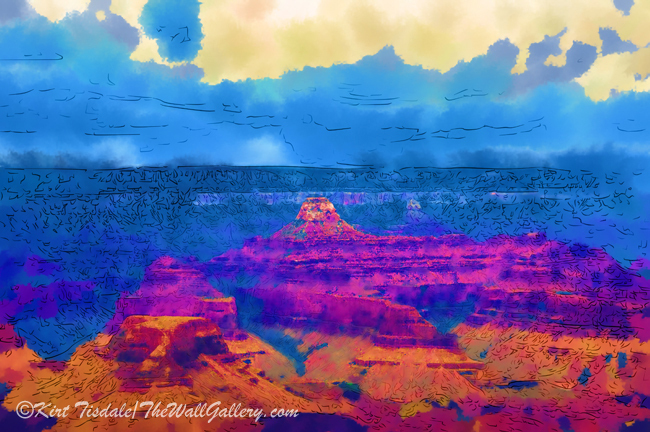 I used an abstract oil style on this print to give it a more modern edgy look highlighting the bright colors. Enjoy! All domestic orders over $60.00: Free Shipping!!. 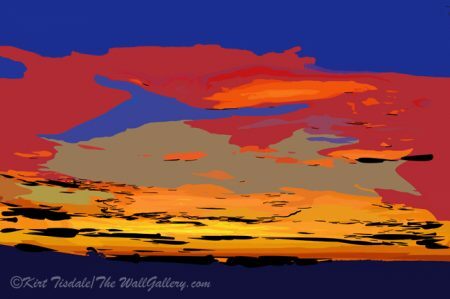 This entry was posted in Abstract Oil, Art Prints and tagged Abstract art, abstract art prints, art, art gallery, art prints, artist kirt tisdale, issaquah washington, museum, online art gallery, railroad, seattle, train station on February 11, 2014 by Kirt D Tisdale.